Skip to the rooting process, if you wish. The iPPea TV is a pretty neat gadget, to say the least. The USB-stick sized device features a full Android 4.0.3 OS, a 1Ghz Ingenic JZ4770 MIPS processor (complete with FPU! ), 512 MB of RAM, 2 GB flash storage, and about 800 MB of internal memory. Overall, it is pretty impressive for only $65. Having received it about three weeks ago for use in the development of the MIPS port of VLC Android, I’ve been meaning to write about this device. Now that I’ve received this device and have time to write, let’s take a look at what’s in it. The iPPea comes in its own packaging, in addition to the 3D gyroscopic remote offered by Option B. The iPPea comes with some packaging. So, after unpacking, we are ready to play with the iPPea. The iPPea simply “plugs in” to any HDMI-enabled TV, just like how a USB stick plugs into a computer. It doesn’t take too long to boot up, about 15-25 seconds-ish (I did not time this). Just a curious note here, the iPPea claims to support full 1080p, but my television reports it to be 720p. I did not notice any lack of quality though, the picture was still very clear and not pixellated. Curiously, the iPPea comes with busybox built-in into the image. This will make working with the iPPea easier, as we don’t have to compile/download busybox and deploy it - full access to all the busybox tools is available by default. But what makes rooting really easy is the fact that the makers of the iPPea handed the blessing of leaving ro.secure off. This means that a simple adb connection is enough to grant root access - all that we have to do is install a su binary. Unfortunately, the busybox su requires too much baggage of the traditional Linux system - notably /etc/passwd, /etc/groups and friends to work. Since this is a MIPS system and Superuser.apk is contains an ARM binary, that approach cannot work either. In addition, compiling su-binary from Superuser.apk requires the entire AOSP tree, which is too much work and network bandwidth for us. So, we will use a portable C implementation of su instead. And of course, once we have root access, the opportunities increase without bound - chrooted Debian/Linux, Android apps that require root, reformat and reflash with a custom ROM - the sky becomes the limit. We do, however, owe many thanks (and this is not meant to be sarcastic) to iPPea for leaving ro.secure at 0, allowing hobbyists to make better use of the hardware (which in itself is very neat). Excellent. I fired up my ippea for the first time and couldn’t find anything on rooting, then the next day I did a search and found your how to. Now all that is needed is booting from the sdcard and I will have a really nice little mips box. Can I link to your page on the ippea forums? Of course, feel free to add hyperlinks as you wish. Firstly, thanks for your info. Just got two iPPea from work, unfortunately their ro.secure are set to 1. Guess I’ll have to find other ways of rooting it. Anyway, I got a quick question, what did you use the connect to it using adb in the first place? Is it just straight from the USB OTG or the USB host port? I used the USB host port. 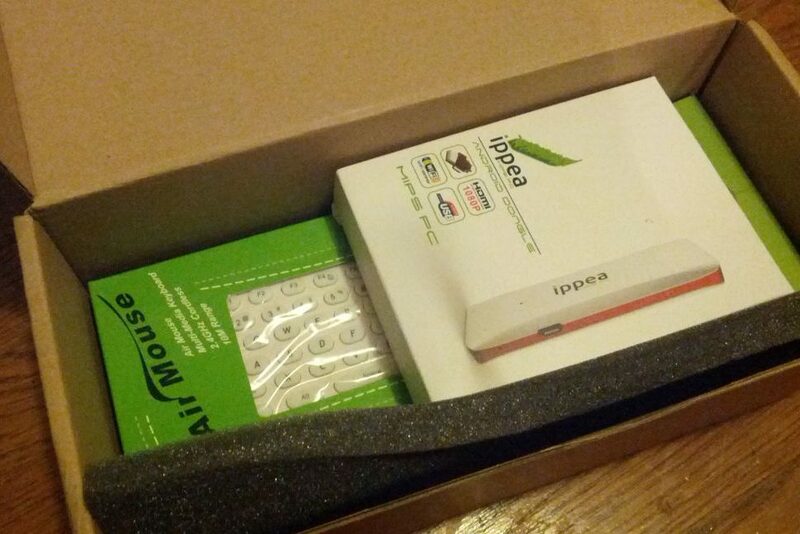 Weird, are they shipping iPPeas with ro.secure=1 now? My iPPea came with ro.secure to 0. Also, I just got a male-to-male usb cable connecting the usb host on the ippea to the computer, but no usb device is coming up there. And when I connect the micro usb otg to the computer it’s only appearing as a usb storage device. Could some kind soul restate the instructions in a linear (step 1, step 2, etc.) fashion? I’d also like someone to tell me why I can’t view my IPPea from my laptop (Linux-bases) when I connect it. I can’t even view it as a storage device. Note: I got my IPPea early last August when they first were released. For the most part, it’s worked well for me. I have had issues with sound (i.e. I don’t have any sound), but that is a television issue that I have confirmed by testing my device on another television. What exactly is not clear? If you be more specific, I might be able to help you. I decided to do the root and have the same issue reported by Pigeon. Connecting to the OTG Micro I get 2 USB devices that I can’t mount, and connecting to the Host USB I get nothing at all. I am wondering if this could be a cable issue? I noticed that using my male2male cable with the supplied Micro that I get no devices, but do get devices with another cable. I tested the cables with other devices an they work fine? I will find another male2male and try again. I tried connecting with another cable and to another computer, but still have no host connection. I tested the device separately to make sure it is still working and the Host USB works with a keyboard. But I cannot find anything wrong? What about connecting the “power” cable to the computer? I didn’t say so, but yes I did connect the power cable to the computer and the light came on. I have both the power cable and a USB to either of the USB port on the IPPea. I can get USB storage devices listed on the one connection and nothing on the other connection; I don’t get anything from ‘adb devices’ in either case. It has me baffled, I will take a break from it and come back to it in a few days. 1) I had to use a a USB to micro USB cable between the computer and the OTG. Using the host didn’t work, nor did using the adaptor cable supplied. I also plugged in the power cable. 2) I had to kill the server and restart with the right permissions before the ‘adb devices’ worked. Until I did this the IPpea was detected, but the command gave a permissions error. After that I was able to ‘adb shell’ into the IPpea and push the ‘su’ command. I was also able to run the ‘su’ command. I am wondering of the update to add the google play store changes the ro.secure setting and then the Term.apk can be installed? I will have another look at this in a day or 2. Well, as long as you pushed it and did the chmod properly as described above, you should be fine. Excellent. You say to run Term.apk, was this installed on your IPpea or did you add it and if so from GooglePlay or from a MIPS apk repository? I did not receive a reply and wonder if anyone reading this blog can help. It seems to be related to Bill’s posts but please feel free to delete or move if you feel this is off topic ….. The update.zip you supplied works great. Thank you for your work. to not have any problems. I have been trying for months to resolve this problem. use to make your update.zip and the commandlines used, would be helpful. The “su” (superuser) program is needed to run programs as root. However my final update.zip shows “Signature Verification Failed” when trying to update my ippea. or tcp access ….. so the method shown at Compdigitec will not work. A complete reset is needed. Are you able to achieve any access with adb with your ippea device? Have you had any success rooting ippea? It’s a universal (Java-based) APK, no special MIPS treatment required. I finally got back to this and successfully rooted my device and installed Google Play. From what i can tell it is the Google Play update that set ro.secure=0 since it was 1 on my device before the update.